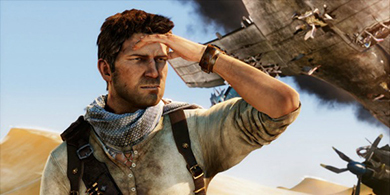 » Can Uncharted Still Chart New Territory on the PlayStation 4? The Uncharted series, developed by Naughty Dog and published by Sony, has undeniably been one of the PlayStation 3's most successful franchises. Naughty Dog, previously known for the Jak & Daxter series and the Crash Bandicoot series before it, took on the Uncharted series as their first foray into providing a game with realistic characters and settings. The original Uncharted introduced us to treasure hunter Nathan Drake and partner / mentor / father figure Victor Sullivan, known as Sully, and outlined the premise that would stand behind every game in the series: Nathan Drake is searching for a rare and priceless artifact and will uncover the shocking truth behind it, and himself, in the process. While the supporting cast will change throughout all three games, with characters such as love interests Elena and Chloe and even Sully coming and going, Nathan Drake, voiced by voice actor Nolan North, will always remain the main character. Each of the PlayStation 3 games in the series has sold over a million copies each and made Nolan North one of the most highly regarded names in voice acting. In addition, the series has also appeared on the PlayStation Vita along with Nathan Drake making cameo appearances in other games, such as Modnation Racers and PlayStation All-Stars Battle Royale. The Uncharted series is known for two things: its gameplay and its setpieces. The game play in Uncharted is your typical cover-based third person shooter with a mix of Tomb Raider-style platforming elements. This allows the gameplay to stay fresh through each eight to ten hour-long adventure, especially when you throw the elaborate setpieces into the mix. Some example set-pieces include Nathan Drake climbing up a series of train cars that are dangling over a cliff, escaping from a sinking cargo ship, battling through a house that is burning around him and a set piece that you must see to believe featuring a cargo plane high in the air. Each setpiece is brought to life by impressive graphics that push the PlayStation 3 to its limit, creating some of the most realistic and jaw-dropping graphics seen on any system to date. Throw in both multiplayer and co-op game modes and it's easy to see why Uncharted is the top of its genre. With the PlayStation 3 nearing its twilight years, many fans are turning their attention to the PlayStation 4 and wondering what their favorite franchises will be like on the new system. Unfortunately, Uncharted fans might not like the answer they receive -- that there may no longer be an Uncharted series at all. If you look at Naughty Dog's history, they typically work on one franchise throughout a system's lifespan. As noted earlier, it was Crash Bandicoot for the PlayStation, Jak & Daxter for the PlayStation 2, and Uncharted for the PlayStation 3. We already know Naughty Dog is working on a new franchise that will see release on the PlayStation 3 in 2013: The Last of Us, that they could very well continue to the PlayStation 4, leaving Uncharted behind. However, there is a silver lining: there is no way that Sony will allow Naughty Dog to shelve one of their best-selling series and one that has become synonymous with the PlayStation brand. While this could mean we may see another developer take a shot at the Uncharted series, similar to how Sanzaru Games is creating the new Sly Cooper game, fans can rest easy that Sony will choose the right developer for the job. So what would an Uncharted 4 look like on the PlayStation 4? While it's hard to imagine a game looking better than Uncharted 3, it's easy to imagine a PlayStation 4 Uncharted game looking almost photo-realistic with plenty of attention paid to the small details such as water and weather effects. One area where the series could grow, thanks to the power of the PlayStation 4, is in the levels themselves; instead of being a linear trek from point A to point B, imagine a more open-ended level system similar to the Halo series where vehicles are necessary to travel from point to point. Thanks to the potential power of the PlayStation 4, an open-world Uncharted is very possible and could be the next step for the series. But what about the characters and the plot? We may have seen the last of Nathan Drake as the star of the series, as his past and present have been fully explored in past story lines. However, we may see Nathan Drake mentor a new treasure hunter, taking on a role similar to his old friend Sully, while the player may take on the role of the new treasure hunter on the block. This allows Nathan Drake to still have a presence in the game, which would make the fans happy, while allowing the story to move forward in a new direction. It's hard to imagine the Uncharted series getting any better, but the PlayStation 4 will contain hardware strong enough to make it happen. We won't know what direction Sony will go in with the next game in the series, or even if there will be a next game in the series, but this generation has made it clear that Sony will continue to find a place for all of their strongest franchises, Uncharted included. PS4 Experts is your #1 source for all things PlayStation 4, including Uncharted! Keep an eye on this page for any updates to the Uncharted franchise as it pertains to the PlayStation 4. There is no denying that the Uncharted series was one of the huge success stories for the Playstation 3. You could maybe even argue that out of all the franchises that were born on the Playstation 3. That Uncharted was the very best. Well with the millions and millions of copies that the series has sold so far. It was clear that at some point we would see a new Uncharted game on the Playstation 4, but could it be sooner than later? Graham McTavish who was the voice actor of Charlie Cutter and Zoran Lazarevic in Uncharted 3 announced on his Twitter account that he was working on a new very secret hush hush project. Of course he was then asked a ton of questions by Uncharted fans, but he did a great job of not giving the game away. While it very well could be a completely different game he was working on. One person on Twitter did ask him when we would see Charlie Cutter again. To which he replied “I will keep you posted”. So while its all speculation it does sound like he is voicing Charlie Cutter once again. Check out more PlayStation 4 games on our PS4 forums! I love Uncharted. I know some fans might be angry if they make a Uncharted 4 and it is only on the PS4. But I think that is the way it should be. Uncharted 4 should be a launch title for the PS4. It would sell systems. i would move the story forward with a new character. This would sell systems and let use get the first look at what the PS4 is capable of. Launch with Uncharted and FF 7 HD. About 6 months later a new GOW and the PS$ will dominate 8th Generation! I highly Disagree with this article, in the inference, that Naughty Dog will stick with their pattern of one series per console generation. For one Crash Bandicoot and Jak and Daxter series popular in their own realm never touched the popularity of Uncharted. Secondly Crash Bandicoot and Jak and Daxter were essentially made for younger gamers who generally do not have the financial feasibility to purchase games on their own. Uncharted was geared for the older crowd of gamers and thus sold a lot more titles do to it demographic and extraordinary game play and story. Naughty Dog would be foolish to not publish another Uncharted game and add onto the expensive world of Nathan Drake, Not only is it lucrative for them and Sony but will give them the ability to branch out and release amazing titles like upcoming The Last of Us.